One of the unlikeliest label partners that Vanessa Carlton ended up working with was The Inc. Records, presided over by R&B mogul Irving Domingo Lorenzo, Jr. (Irv Gotti). The album that resulted from the partnership signaled the surfacing of Carlton’s idiosyncratic songwriter side. On the album Carlton finally embraces her long dormant inner rebel and nonconformist with a selection of material that is part upbeat pop songs, and part more solemn and introspective numbers. On the whole it is a record that looks to the not too distant past and Carlton’s future. Considered a failure from a commercial standpoint, it is a resounding artistic success. “Heroes & Thieves” is an important transitional record in Carlton’s development as a songwriter. It was co-written by Linda Perry (4 Non Blondes) and inspired by Carlton’s breakup with songwriting partner/producer Stephan Jenkins. No longer content to be pegged the pretty-girl-behind-the-piano Carlton wrote a more personal album. For the first time do to the more introspective songs outweigh the lighthearted ones. Some of the more layered and elaborate vocal melodies expose Carlton’s limitations as a singer. Likewise does her all too girlish and too silken voice undercut the darker themes that her lyrics, and the album as a whole, explore. ‘Nolita Fairytale’ is about Nolita, the neighborhood in Manhattan, New York where Vanessa grew up. There’s a surprising amount of self-awareness in the lyrics Carlton penned for the song. She refers the apartment where she wrote most of the album, her pet dog Victor, takes a jab her former record label (‘take away my record deal / go on, I don’t need it.’), thanks her writing partner Stevie Nicks (‘Stevie knows / and I thank her so / cos it’s your seeds I sow / and now I know.’) how she discovered herself ('spent the last two years getting to what's real') and her desire for something real ('now take the glitz back / I want the soul instead') ‘Spring Street’ uses a touching mother-daughter narrative to point out how we all turn, sometimes inadvertently, into our parents as we grow older. ‘Come Undone’, about the feeling of comfort around a loved one, starts off with a brooding organ/mellotron melody but turns into a sweet little love song after. The connections with classic rock act Fleetwood Mac run deeper on this record as Stevie Nicks, Carlton’s mentor and sometime producer for the album, provides guest vocals on ‘The One’. ‘Heroes & Thieves’ deals with assessing friendships we come across in life. Breaking with tradition on several fronts lead single ‘Nolita Fairytale’ does it figuratively and literally. The music video for the track recreates the garage scene from ‘A Thousand Miles’ in minute detail, but something doesn’t feel right. As Carlton starts playing the first notes she suddenly turns around and runs off while a yellow cab (a magnificent piece of pop culture cross-marketing if there ever was one) literally, not figuratively, destroys her piano. Suffice to say it is an indicator that “Heroes & Thieves” is different from her previous work. The illustrations by James Riches add an indie dimension to the previously meticulously wardrobed and photographed singer’s album. Vanessa Carlton is still her recognizable self in all the ways that matter, but her fashion choice and imagery is now clearly her own. The album was written by Carlton in collaboration with “Harmonium” team Stephan Jenkins and Linda Perry plus with input from Irv Gotti. “Heroes & Thieves” is a record that pulls in several directions at once. The change in direction is instantly recognizable from the djembe and marching band percussion that opens ‘Nolita Fairytale’ before Carlton’s piano comes in. While stylistically similar to the majority of “Harmonium” and “Be Not Nobody” before it “Heroes & Thieves” is not nearly as instantly poppy as her early work under the tutelage of Ron Fair. The first four songs reminiscence the most of her tenure with A&M – it’s in the album’s second half that Carlton’s new direction starts to surface. 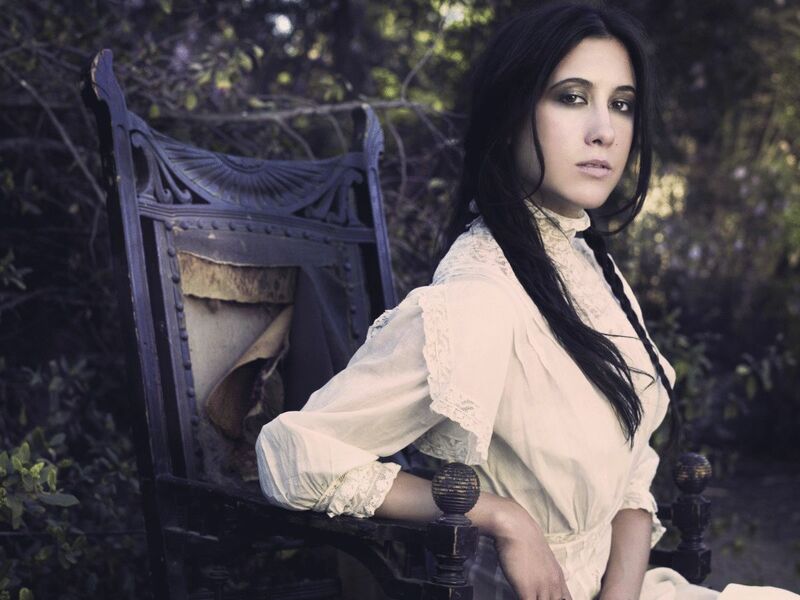 As the last of three to feature any overt pop stylings “Heroes & Thieves” marks the end of an era for Vanessa Carlton as an artist coming of age. The record is far more measured and mature than her preceding two records, which is mostly reflected in the lyrics she penned for this session. While not radically different from her prior two albums the influences of genres outside her comfort zone pull the record in directions where it doesn’t need to go to. Carlton is at her strongest when she is allowed the liberty to write fragile little pop songs with her trusty piano (or a similar instrument as a organ, or harmonium), an acoustic guitar and a string section. This Time’, ‘Home’ and ‘More Than This’, the last three tracks of the album, is where Carlton shines her brightest as all three are simple, honest pop songs without any excess instrumentation. For the last time Carlton convened at at the acclaimed Skywalker Sound, and Mourningwood Studio with Stephan Jenkins producing and Sean Beresford engineering to record and assemble "Heroes & Thieves". Manny Maroquinn at Larrabee North Studios, Universal City, CA mixed the majority of the album. Two songs (‘Spring Street’ and ‘This Time’) were mixed by Bill Botrell at The Pass, Los Angeles, CA. The album was subsequently mastered by Emily Lazar, with assistance from Joe LaPorta, at The Lodge in New York City. The illustrations by James Riches set the stage for the metamorphosis and reinvention to come on the next album. 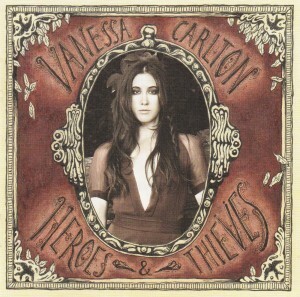 “Heroes & Thieves” had the unfortunate distinction of being the transitional album that saw Vanessa Carlton pulling away from her easily digestible pure piano-pop beginnings into more individual and less commercial territory. Not even the two music videos for the album could help improve the sales numbers. The album sold just over 18,000 copies in its first week of release – and was considered a commercial failure. By 2011, the album has sold approximately 75,000 copies in the United States. Notwithstanding the odd pairing of r&b mogul Irv Gotti and a singer-songwriter as Vanessa Carlton the two amicably parted ways once the promotional campaign for the album had ended.